To create an Invitation click on Special Ed-> IEP Details-> Click "Select Action" Dropdown-> Click "Wizard Quick Resume"
From the IEP Wizard Quick Resume Menu, select IEP Wizard Supplemental Aids/Services Need List. 1. Click the Edit link to make changes to the Aid/Service. 2. 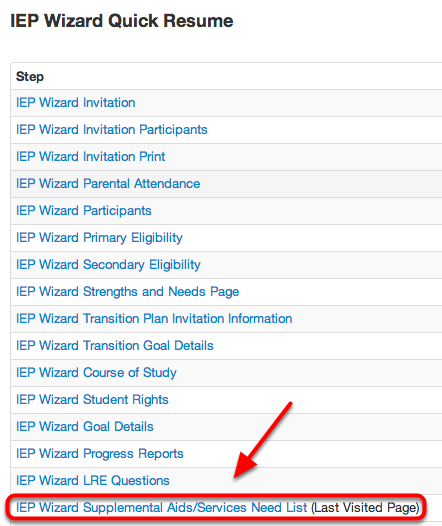 Click the View link to view the IEP Wizard Supplemental Aids/Services Need List. 3. Click the Delete link to remove an Aid/Service. Once you are finished making any changes to the Supplementary Aids/Services Need List page click the Next button to continue to the next step in the IEP process (i.e. Program/Service Details).